So The Legal Genealogist was talking about taxes yesterday, in the Legacy Family Tree webinar “A Taxing Matter: Using Tax Lists in Genealogy,” and one term seemed to give some folks some problems. And the problem was that profits were in fact included in early tax codes. That sounds like an income tax, doesn’t it? And we didn’t have an income tax until the ratification of the 16th Amendment in 1913,3 right? The fact is, the tax man has tried to wrap his paws around incomes for a very long time — and sometimes succeeded long before we ever had a 16th amendment. You’ll see these taxes imposed throughout New England in the colonial period, and similar laws passed by states during and after the Revolution. That federal law, by the way, taxed a whole lot more than incomes, and created a truly wonderful set of records that have been digitized and are readily available online. Take a gander, if you haven’t already, at the collections entitled “United States Internal Revenue Assessment Lists, 1862-1874” at FamilySearch and “U.S. IRS Tax Assessment Lists, 1862-1918” at Ancestry. So yeah, really, taxes on profits… or incomes, if you prefer… long before the 16th amendment. 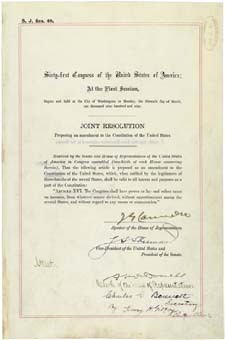 Image: The 16th Amendment, National Archives, Washington, D.C.
Giggle. You used the phrase “take a gander” two days in a row. -Has the National Archives indicated how and on what schedule IRS tax returns starting in 1913 will be retired to the Archives? -There are fragments of the 1798 Federal Direct Tax you mentioned for nearly all the states. They are just the devil to find. I have relatives in all 3 surviving Georgia counties. -The early Georgia tax rolls have Quality I, II, and III land. Any sources around that would define how these were determined? I am searching the 1804 tax legislation but it only refers to the rates for each Quality category and not a definition. No instructions for tax collectors have been located. I will continue to search the legislation and the GA Secretary of State land website.